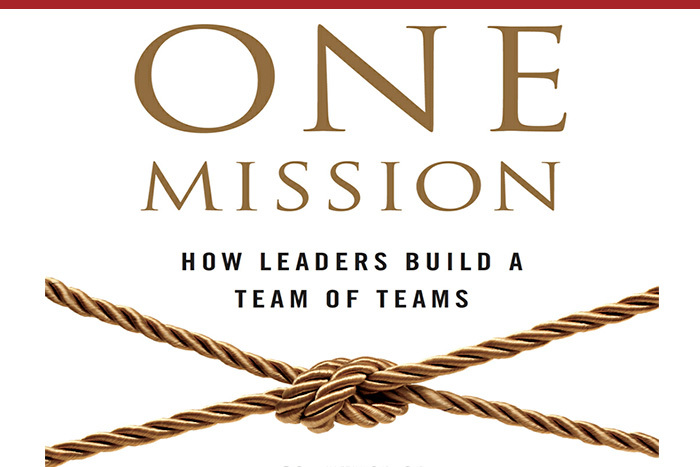 One Mission: How Leaders Build a Team of Teams, by Chris Fussell and C.W. Goodyear published in 2017, follows on from the highly successful book, Team of Teams, that Chris co-authored with General Stanley McChrystal and others in 2015. General McChrystal, was commander of Joint Special Operations Command (JSOC) whose last assignment was commanding all U.S. and international forces in Afghanistan. He is currently a senior fellow at Yale’s Jackson Institute for Global Affairs and co-founder of the McChrystal Group, a leadership consulting firm where Chris Fussell and C.W Goodyear are his colleagues. Generally, I would not be attracted to a management book written by military men, whose ideas are rooted in their military experience. I know this says more about me and my biases, but my assumption was that the military experience is very different from the corporate and organizational world – and I was sceptical of the relevance to that world. I eventually picked it up to read on the recommendation of my colleague, Tim Dalmau, whose judgement in this area I respect. In addition I, like many others in this age of rapid communication and constant change, have observed that the traditional hierarchy of organizations seems to be stifling their ability to be agile and solve the complex problems they face. So there is a pressing need to explore other forms for organizing work. The whole ‘start-up’ phenomena is a testament to this, and hence my curiosity was aroused to see if recent military experience may have relevance to the corporate world. General McChrystal, in his introduction to One Mission, and the authors in their introduction used their experience in evolving the organizational structure and operations of the US and international forces in Afghanistan, to match more closely the highly flexible and continually changing distributed network style organization of Al-Qaeda and insurgents generally. Conventional military forces first came across this dilemma in the American War (also known as the Vietnam War) and it was first highlighted in Larry Pensinger’s 1994 novel Moon Over Hoa Binh. They describe how the traditional bureaucratic, high command and control type of environment pervasive in the military as well as in the corporate world, was just not designed to meet the high levels of unpredictability, and the speed of information flow in our now digital world. They observed that Al-Qaeda and insurgents were networked and constantly changing in response to the surrounding conditions. But they also noted that these networks were designed for immediate adaptation, not long-term planning. Whilst this was an attractive model of organizational design and “through its core narrative cause may be scalable and sustainable, its amorphousness and lack of any central control makes it a poor way of directing an enterprise” (Ch2, Location 817). The book describes how to create this hybrid organization, drawing-on Fussell’s military experience, and a range of corporate sector case studies. Creating a ‘decision space’ – an explicitly communicated lane of decision authorities owned by critical leaders and teams within the organization. Identifying and creating special a role for individuals (known as Liaisons) – a role for trusted members of the organization who “promote trust, cooperation and understanding among different groups – they are the culture carriers and well versed in the aligning narrative and strategically positioned and empowered to facilitate the interconnection(s)” with key stakeholders and critical partners outside the organization. They provide exposure to the organization’s aligning narrative, so that as necessary, they can be brought into collaborative problem solving. I had a number of reactions to reading this well-written book. On one level I had to wade through lots of narrative to get to the essence of how to actually build a team of teams, and make real the hybrid model. It is a book that probably is better dipped into than read cover to cover. However, this is challenging to do until you really come to grips with the core practical concepts and strategies that Fussell and Goodyear describe for creating a team of teams. One Mission does not provide a prescribed or recipe-driven approach – which makes total sense if you understand systems thinking. Story and case study are used and from this emerges their model. As I said earlier I was somewhat skeptical as to the relevance of military experience for the corporate sector and I was also questioning if there actually any new and original ideas contained in it, or had a new jargon been created to cleverly market others ideas. My conclusion is that the whole approach of Fussell, McChrystal and their colleagues is solidly rooted in systems thinking and applying a whole of systems approach to creating change and improvement in performance in large, complex (and often highly dispersed) organizations, military or otherwise. As such I think it offers some great insights. In essence the principles derived from systems thinking (eg emergence, non-linear communication, positive feedback flows etc) are not new, but what is new and useful are the practical approaches to implementation which I found thought-provoking. It certainly enhanced my understanding of applying system thinking to organizational structures and processes, especially in an increasingly unpredictable and fast-changing environment. The authors have challenged me to think about how the ideas and strategies might be useful to both current and future clients assisting them to become more flexible and agile in the face of rapid change and complex problems. One way could have the leaders, or executive team or even a change management team within an organization read One Mission, and follow this with in-depth discussion focusing on the relevance the ideas and how they could adapt and apply some of the approaches that Fussell and Goodyear describe. In complex organizations facing complex problems, the ideas from One Mission will bring new insights and stimulate experimentation with new ways of operating that could very well equip them better in a changing world.